Parent aged 1,000 Sherwood Forest. This is the story of an attempt to plant a new Oak Wood in a 7 acre field in Dorset, England. The Project began in October 2000 with the collection of 500 acorns from the Major Oak, a very famous tree in Sherwood Forest. Pastureland was purchased cheaply in November 2002. A great deal of hedging, ditching and fence-building was done in 2003. Meanwhile 300 acorns had grown into good-sized saplings, and were planted out in 2004. Two ponds were dug and populated with local shrubs and flowers. A battle with field voles in late 2004 lost 28 trees. 2005 saw the first flood of the nearby River Stour, which the saplings all survived. Now in 2006 our little oaks are growing well thanks to many hours of maintainance. Along with the new Wood, it is hoped this website will grow to record the progress and problems of a project that seemed to plan itself, and turned out to be not quite as easy or as cheap as the author first thought. By 2013, some trees were nearly 5 metres high and 70 cms girth, producing 1,000 acorns in a year. In 2015 branches scraping the ground were cut off (as we have no deer to do the job). A New Sherwood---Why I'm keen on the Big Tree and what we've had to do. 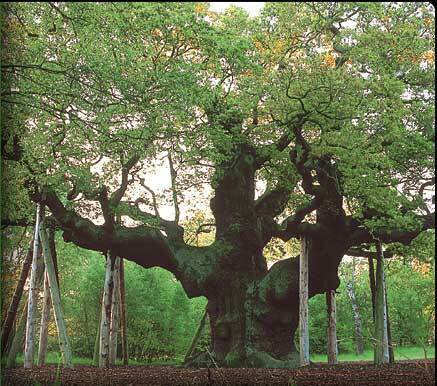 The Major Oak of Sherwood Forest ---Where the acorns come from. Bear Mead on the Dorset Stour---The history of the area where we planted our oak saplings. Sketch of proposed new Oak wood---Aerial photo+sketch map+vital statistics. Oak Blog - diary of planting an oak wood---How things have happened and when. Photo Album---Index of photos of the plantation, taken over the years. How to plant oaks---How to plant oak saplings on a floodplain. Oaks & Oakwoods---Extracts from the book by A.G.Tansley FRS published 1952. Parasites on Oakwoods---Text and photos. Galls on oaks---Pictures and text about some of the fascinating galls on oaktrees. Oak Processionary Moth---Which strips oaks of leaves in May. Map, size and progress of oaks---Map of field, size of each oak and statistics with notes. Progress of oak leafing---Map of plantation, showing those trees in leaf. 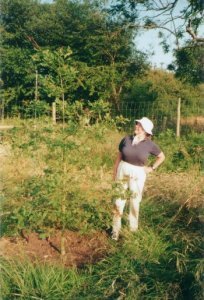 Pictures of little oaks 2004--- 4 months after planting into field. The ITF gang get planting---ten volunteers plant 80 oaks in 6 hours. A Gallery of Photos---Photos taken by the Worksop Guardian. Flowers on the Plantation---Growing naturally or added to beat monoculture. A BBC Feature---Headline: "Dorset plans rival Sherwood Forest" (Nov 02). A magazine article---"Tall oaks from little acorns grow" (Summer 03). A Newspaper Report---Headline: "Major Oak's 350 'babies' have a new home" (Sep 03). An ITV television Interview----For "Heart of the Country", broadcast in the Midlands (Jun 05). A BBC Radio Solent Feature----An Interview on "Topsoil" (Sep 06). Hot weather causes chaos to the eco-system---An article by Dennis Furnell. Memorial Trees---An idea to raise money. Oakwood of Remembrance---Those who are remembered by the planting of an oak tree. NBL Plantation in Derbyshire---A plantation of 12,500 trees from the air. Budburst 2007---Flood then drought, but the oaks cope. Willows---Sign on row of Willows, planted 28 Sep 05, dedicated to the Ashes Series that year. Measuring water levels---on river, well and Mill stream with plastic pipes. Old oaks nearby---location of some old oaks near the author. Flowers in our garden---its spring again! Runt oaks---threatened by high grass. New generation of acorns---A heavy crop in a 10 year old tree. Compiled, formatted, hyperlinked, encoded, and copyright © 2006, John Palmer, All Rights Reserved.